Once settling into your room, a visit to the Royal Blues' lounge and its exceptional restaurant, Chanson, is a must. Chanson is an impressive sight, a continuation of the same clean, thoughtful design and color palette as the hotel. Brilliant natural light, intensified by the nearby sand, illuminates the intimate space, welcoming visitors into an approachable yet fine dining experience. While people and ocean watching take place with ease from inside the restaurant, the outdoor patio is perfection for dining and drinking the night away (weather permitting, of course). Each table hosts an orchid centerpiece for a simple pop of color and form to the clean lines of the room. Royal blue hues, owner Edward Walson's favorite color, make appearances throughout the hotel, and is incorporated into the space via the lovely glassware. Immediately, a striking black-and-white portrait of Muhammad Ali, among other beautiful beach-themed photographs, makes its way to my eye. This is a pleasant sight, as one won’t often witness the clever use of photography in restaurants. Perhaps most notable is the grand, 1,500-gallon saltwater aquarium festooning the restaurant’s ceiling. Sure, aquariums are common in restaurants. But ceiling aquariums? Perhaps even more impressive is the aquarium’s extension outside to the Royal Blue's pool, where diners view a colorful variety of tropical fish while taking an afternoon dip. This whole new breed of art allows vacationers to stay connected to the tranquility of the sea without donning a snorkel. In terms of cuisine, Chanson is revered for an inventive “Cuisine du Monde” (international or world cuisine), as well as its dedication to sourcing fresh and organic ingredients from local purveyors, growers, and fishermen. This assures an ever-evolving menu following the seasons. The cellar features around 120 different reds, whites, pinks, burgundies, and—wait for it—orange wines! With a space this impressive, you've probably already guessed that the food is impeccable (and you'd be right). But it gets better: Chanson is also one of the few boutique hotels you'll find with an in-house sommelier. Krystal Kinney is a consummate professional, possessing an unwavering dedication to quality, combined with expert knowledge and a passionate reverence for wine. Sommelier Kinney considers the wine selection one of the truly extraordinary things about the restaurant, and I couldn't agree more. The cellar features around 120 different reds, whites, pinks, burgundies, and—wait for it—orange wines. At any given time, Chanson houses approximately 2,000 bottles from 16 labels, none of which will be relegated to store shelves. When I asked Kinney to describe her approach to Chanson's wine collection, she responded, "We are very picky about selection." She favors old-world style wines from Germany and Austria and a healthy quantity of "cult" wines from US and international boutique producers. Visitors looking for new wine discoveries ought not miss the daily tasting offered in the lounge. One can also sip through their by-the-glass selections, served from an Enomatic preserving system, which locks in freshness and preserves the integrity of each magnificent wine. My first impression of Chanson’s culinary team was that these guys (and gals) take what they do very seriously — their standards, incredibly high. My instincts are realized the moment I see the first of the dishes: harvested diver sea scallops, garlic fondue, chanterelle mushrooms, glazed in chanterelle mushroom syrup, with sea purslane, wild watercress, and puffed lentil granola. One word repeats in my head over and over again: ART! The dish is delicate and earthy, each component perfectly executed. Sommelier Kinney selects a rare, small batch orange wine of only 3,000 cases as the accompaniment. Gewürztraminer is an aromatic grape variety typically used in white wines or rosés, but this particular wine by Biggio Hamina Cellars drinks more like a red wine. When I ask how rare this wine really is, Kinney responds, “I am the only one who has it in the state." That’s pretty rare. Now comes the entrée: seared foie with hibiscus-infused waffle, dehydrated honey, crisp frisée, and sour cherry marmalade, and it's every bit as alluring as the scallop appetizer. The depth of flavor layered into Chanson's creations are extraordinary. The dishes may be delicate, but the flavors come out swinging. The foie is expertly paired with a German Riesling Kabinette by Darting. This sparkling white wine is off dry, with aromatics of flowers, citrus, gardenias, and orange blossom. The finish is crisp and clean, with a hint of honeysuckle. The citrus notes, along with nice acidity, make it the perfect accompaniment to the foie, cutting through the fat and adding another dimension of flavor. While I could dwell in Chanson forever where the aquarium fish and the foie gras become my spirit animals, it's off to the Lounge, where Bar Manager Diego Sena greets me with a familiar passion of excellence I find in every other area of the hotel — only this time, the passion takes the form of cocktails. The lounge is a cozy, intimate space. With seating for 12, it possesses the signature Royal Blues elegance. But in here, things are a bit more relaxed. As I make my way to a table, I stop to enjoy paintings from Walson’s collection featured over beautifully upholstered sofas. I ask for a cocktail recommendation, and Diego immediately concocts "Georgia on My Mind". "It's kind of like a Bourbon Smash," he says. "If you like Bourbon, you'll love this." Like Bourbon? It's one of my spirits of choice. Bring it on! The "Georgia" features Buffalo Trace bourbon from one of the most decorated distilleries in Kentucky for over 200 years, plus peach oleo, and fresh peaches. The oleo is crafted in-house with juicy-ripe peaches for sweetness and lemon zest for brightness. Pellet ice keeps the drink refreshingly cold and a mint garnish blends into the other ingredients midway through, infusing freshness. It's a beautiful blend yielding an extraordinary cocktail. It's sweet, but not too sweet, the rich bourbon flavor not buried in the least. And while many consider bourbon a cold weather drink, one can sip these by the pool all day and feel refreshed. The Royal Blues employs an expert mixologist to develop their specialty cocktails, each made with fresh organic fruits of the same exacting quality used by the chefs. 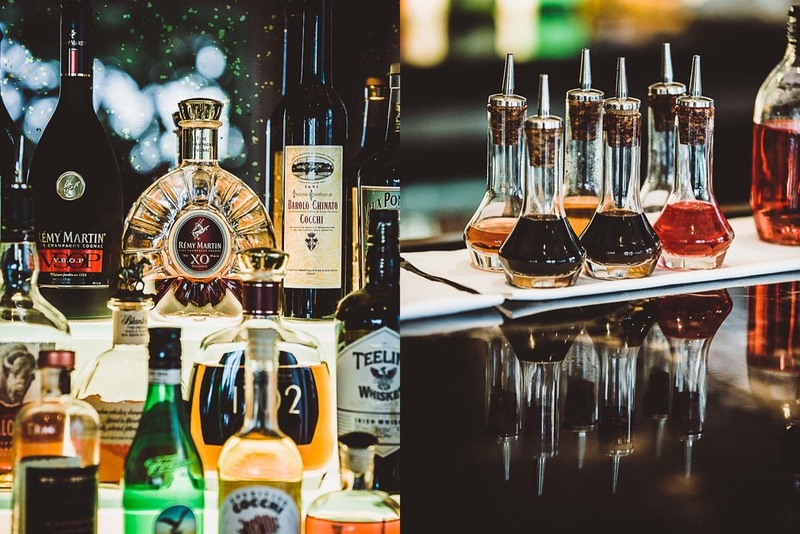 The lounge's theme is "slow food for drinks", and, when possible, ingredients are sourced locally to produce made-from-scratch juices, syrups, and infusions. Many of the summer drinks are "tiki style", the latest cocktail trend, so naturally I have to sample at least one. Diego recommends the Florida Fizz, a piña colada inspired drink in a "fine dining style". Gin and rum based, it's blended with organic coconut puree, orange flower water for a light citrus flavor, and fresh squeezed pineapple juice. For a creamy texture, it's given a good shake just prior to serving. I finish my drink and am soon lost in chats with my fellow lounge guests. Too quickly the time approaches for me to head out of the cozy, friendly cocoon and experience the beaches and surrounding area. If I've learned anything from this exploration, it's that there's simply never enough time. There’s so much to share about Walson's jewel in Deerfield Beach; for now, just know this sleepy little town, unknown to me my whole life, has become one of my favorite places in South Florida. And this is due in no small part to the extraordinary dining, hospitality, and awaiting me on my next visit to the Royal Blues Hotel.